This lush artificial birds nest fern arrangement is handcrafted by House of Silk Flowers. Show your sense of style by adding this to an empty corner in any room of your home or to add a little life to your office. 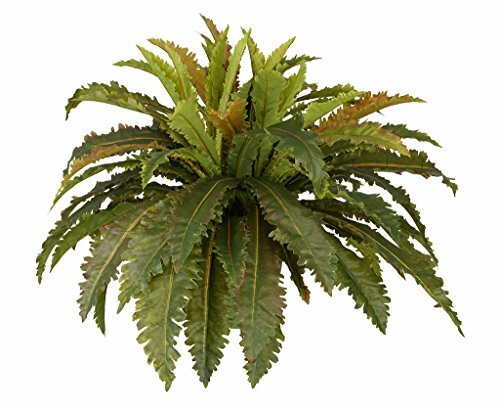 This contains a professionally-arranged artificial birds nest fern securely "potted" in a non-decorative nursery pot (6" tall x 8" diameter). The plant has been arranged to allow 360-degree viewing. The overall dimensions are measured leaf tip to leaf tip, from the bottom of the pot to the tallest leaf tip: 21" tall x 30" diameter. Measurements are approximate, and will be determined by your final shaping of the plant upon unpacking it. No arranging is necessary, only minor shaping, with the way in which we package and ship our products. This product is only recommended for indoor use. Our unique patent pending design allows you to purchase one planter with multiple trees to change your design as your mood or the seasons changes.